Library information for the MLC Faculty. This slideshow demonstrates ways to locate various types of MLC library resources. The regular library loan period of most MLC items is 3 weeks. You may renew items beyond that time; if you know that you’ll need an item for a longer period, please contact Liz Wessel (x242) and she can extend the loan period for your item(s). *Student staff are not generally authorized to extend due dates. Faculty do not accrue fines on library items if they are checked out at MLC using your faculty ID. Your ID card may also be used at nearby libraries that are part of the Traverse des Sioux Library Cooperative (including New Ulm Public Library). You do not need to have a public library card in order to check out materials at these libraries. The faculty fine exemption will not apply to those items checked out at other libraries. Loan periods may vary for ILL items, the items may or may not be eligible for renewal, and fines may be owed for overdue items. The policies vary according to where the item came from. To be good citizens of the ILL community and to avoid fines, please pay careful attention to due dates and return items on time. Please contact the Reference Librarian by email or by phone at (x249 or x209), with any questions regarding ILL items. If you find that you need certain ILL items repeatedly, you may choose to place a request for the items, to be purchased for our collection. In order to be most efficient with our resources and to obtain your items most quickly, please use the following sequence in searching for items. 1. MLC/Traverse des Sioux Online Catalog: The catalog will default to search ALL the libraries in the TdS System. Items put on “hold” will arrive by carrier within a few days. You will receive an email notifying you of its arrival. 2. MNLink Gateway: Finds materials throughout Minnesota. These items are sent through a courier service. This service takes 3 to 9 days to receive. 3. OCLC WorldCat finds materials throughout the US and beyond. Items are shipped through the US Postal Service. This service takes 3 to 9 days to receive. As always, we are happy to provide any help or instruction that you or your students need in order to use our library resources well. Please contact Reference Librarian to set up an orientation or instruction session. The Reserve Shelves are located behind the circulation desk. Professors can hold materials in Reserves specifically for a course, or other school-related activity. Reserve materials are classified into two types. Are items that can be used in their entirety or partially within a 2-hour period. The materials are to be used in the library. Are available for a 2-hour time period. Items can be renewed at the end of the 2 hours unless another student is waiting for it. Overdue fines are .25 cents per hour. These guidelines prevent the books from being out of circulation and unavailable for long periods of time. Material that is needed for a longer time period to complete the assignment. Items will have a regular book checkout period of 3 weeks with 2 renewals unless another student has placed a hold on the item. Items for the reserve shelf must be part of the library’s collection or personal property of the professor. Our library does not accept items from other libraries (ILL) for our reserve shelf. Download the Reserve Form. If prompted save to your computer. A new window will open in form editor. Go to File and Save As My Reserve Materials or something else. The materials to be designated for the reserve shelf will be processed by the reserve librarian. Materials may be placed on the reserve shelf for the upcoming school year a month before school starts. The items on the reserve shelf should be current for the courses taught during each semester of the school year. Please review your reserve material list at the end of each semester to maintain current status. The library appreciates your cooperation in keeping the reserve materials up to date. The Library catalog is designed with specific facets that don’t allow altering the item checkout time limits. The Library can no longer place materials with special checkout policies that are different than those programmed by the computer software. See Borrowing Policies. This prevents overdue materials, and misunderstandings by students and desk workers. If necessary, Professors are asked to make other arrangements with their students. Professors are also required to check out materials from their Reserve shelf if needed for class. Personal books, tapes, and materials can be put on your reserve shelf. The item will be barcoded and linked to a record in the library catalog. Security tags are available by personal request. Please direct any questions or comments about the Library Reserve Policies to Jan Nass, Reserve Librarian. E-mail: nassja@mlc-wels.edu, or call extension 327. *Please speak to the Reserve Librarian if you have further questions. 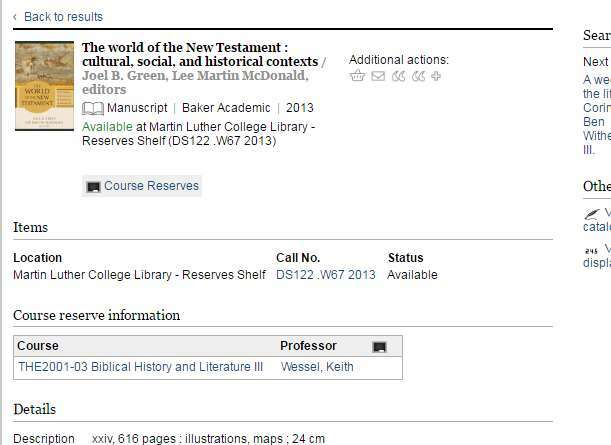 Finding Course Reserve Materials using the Library online catalog. Reserve materials for your courses can be found by searching the Encore catalog by instructor or course name. a. Browse the Results Menu on the left, look for Course. If there is more than one course that matches the search query, choose the appropriate item from the browse list. b. Selecting a course title will retrieve all the items on reserve for that course. 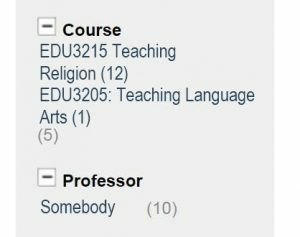 c. Selecting “Course Reserves” on the item page, will take you to the detail page, which also lists the Course Title and Professor’s name. 2. Choose Professor, all the items the professor has placed on reserve for his/her courses will be displayed. Our reference librarian, Kathy Lotito, is happy to work with your classes in providing library tours, or instruction and orientation in the library or in your classroom or computer lab. The scope and timing of these services can be tailored to meet your needs. To arrange instruction or tours, contact Kathy by phone or email or complete the classroom instruction request form. The Curriculum Builder tool works with Moodle and the library’s Discovery search to allow you to place links to library-subscribed articles and information in your Moodle course reading lists. See our slideshow for step-by-step instructions in using Curriculum Builder. For more information, see the Curriculum Builder section of the “Moodle Tips for Faculty” course in Moodle, or contact Linda Kramer in the library.